In this Lisbon travel guide for food lovers, you’ll find firsthand tips on what to do, how to get around, and most importantly, some incredibly delicious food you don’t want to miss in Lisbon. From traditional Portuguese food to amazingly fresh seafood, Lisbon is a city that will reward any food lover. Let’s get started with this Lisbon food and travel guide! Download this Lisbon guide as a PDF eBook now! 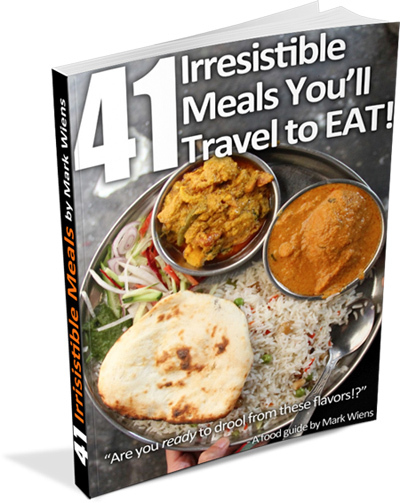 Since this guide is long and packed with useful tips for your food trip to Lisbon, I created it into a PDF eBook so you can access it offline. You can download it completely FREE, or you can choose an amount you want to pay. I’m very thankful for your support! If you fly into Lisbon, you’ll likely land at the main international airport, which is officially known as Lisbon Humberto Delgado Airport or also known as Lisbon Portela Airport (named from the neighborhood that it’s located in). My wife and I flew from Barcelona to Lisbon on TAP Portugal, and arrived to the airport which was relatively small and calm. The Lisbon airport is located about 9 kilometers from the center of the city. Bus – Taking a bus is a great and budget option for getting to various locations around Lisbon. Since my wife and I landed in Lisbon in the middle of the morning, we decided to take the bus to see some of Lisbon on the ride. 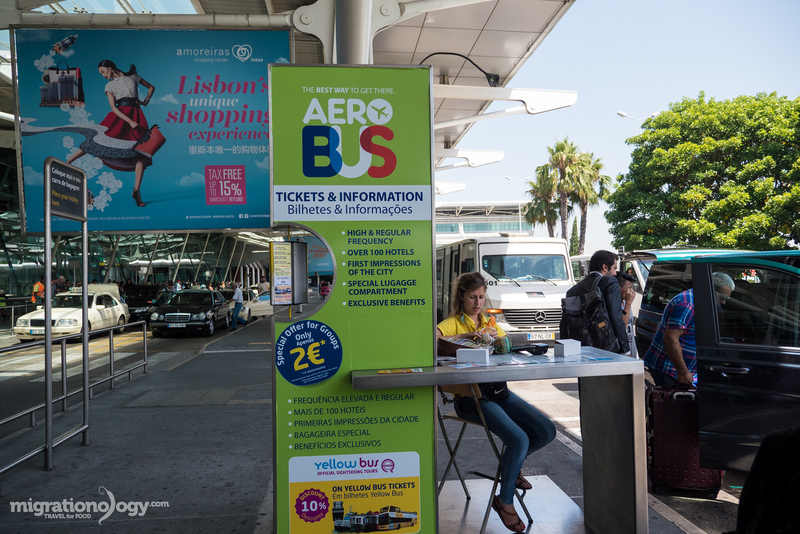 The Aero Bus stand is located outside the arrivals terminal, and there’s a stand where you can buy your tickets and wait for the bus to arrive. The routes are very clear and organized, all the information is on the Aero Bus website, and a ride costs 3.15 EUR per person. Private Taxi – Taxis are always an option as well, though they are the most expensive (but sometimes) the most convenient option. You’ll find a queue for official taxis outside the arrivals hall, and a taxi from the airport to the center of Lisbon, depending on traffic, will cost you 10 – 20 EUR. But a travel tip from this post on Tripadvisor, says you might be able to get a taxi from the departures floor for cheaper and possibly less of a queue (I can’t personally confirm). Portugal is part of the Schengen Agreement, so depending on where you’re from, if you need a European Schengen visa, you’ll need to apply for it to enter Portugal before you arrive. I carry a US passport and US citizens don’t need a visa to enter Portugal for up to 90 days. For my wife, who is a Thai citizen, she applied for her Schengen visa back in Bangkok prior to our arrival in Lisbon. Make sure you do some of you own research depending on your nationality and the requirement you need to get a Portugal visa. Lisbon is a popular European tourist destination and there’s a full range of accommodation you can choose – all the way from budget hostels and apartment rentals to five star heritage hotels. In this section of this Lisbon travel guide, I’ve arranged it by popular areas of town (because location is one of the most important factors in choosing a place to stay). And in each area I’ve shared a few hotels and places to consider. 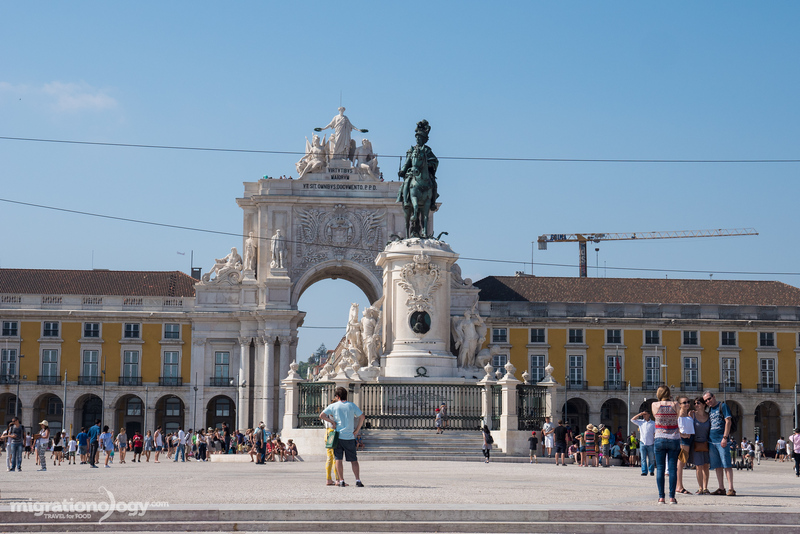 This is the heart, the center of Lisbon located near the Praça do Comércio, and surrounded by attractions, cafes and restaurants, public squares, and plenty of transportation options. One of the benefits of staying at a hotel in Baixa-Chiado is that you can walk to many places and you’ll be right in the center of Lisbon action. There’s a good selection of guest houses and hostels throughout Baixa-Chiado including Yes Lisbon Hostel and Lisbon Old Town Hostel, both of which offer affordable accommodation is great locations. Located just a short distance north of the hustle and bustle of Baixa-Chiado is an area of Lisbon called Santo Antonio. The area of town opens up more with more space and it’s home to Avenida da Liberdade which is a huge tree lined boulevard known for shopping and designer brands. 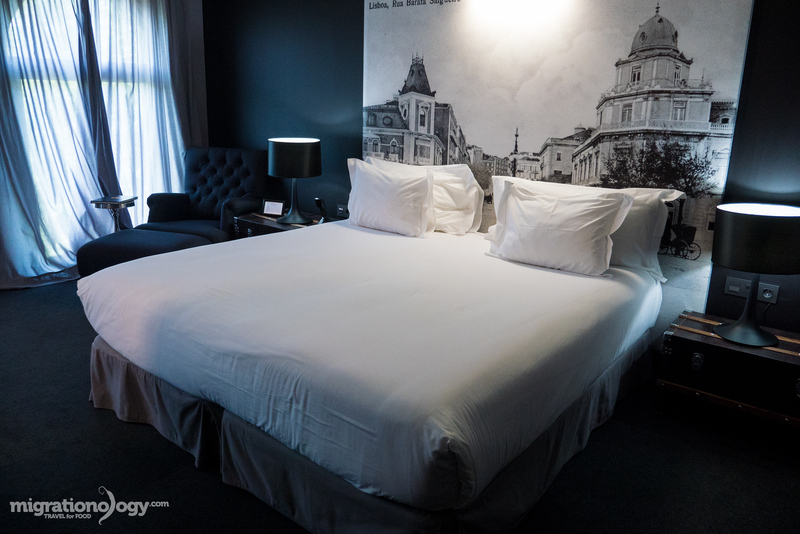 In this area of town you’ll find plenty of luxury and designer hotels like Fontecruz Lisboa, which is the hotel my wife and I stayed at during our trip to Lisbon, and the classic Heritage Avenida Liberdade. Barrio Alto is a beautiful hilly district of Lisbon where you’ll find narrow lanes and plenty of local culture. There are many restaurants, cafes, and bars, tucked within Barrio Alto, and it’s also known for being one of the centers of Lisbon nightlife. Barrio Alto makes a great place to stay if you’re looking to be close to the center of town, but have a bit more of a neighborhood feel to it. Small boutique apartments like Alma Apartments are common throughout Barrio Alto. Being the oldest neighborhood in Lisbon, Alfama has a beautiful charm to it and is home to a few of Lisbon’s most famed attractions like the Lisbon Cathedral. When it comes to places to stay, Alfama is a great area to search for apartment accommodation like Pátio Alfama and small hotels like Hostel Petit Lusa. What hotel did I stay at in Lisbon? On this trip, my wife were on a sponsored stay at Fontecruz Lisboa (Marriott Hotel). I especially loved the location of the hotel, along the tree lined Avenida da Liberdade where it was quiet and peaceful, yet just a 10 minute walk from the action of central Lisbon. As for the hotel itself, I didn’t like the black color theme, but the room was comfortable and service was good. You can also check out all my camera gear here, and my complete travel packing checklist that includes everything I brought. When you think about Portugal, the “Age of Exploration” is something that might come to mind – it does for me. What I think really shapes Portuguese cuisine, as well as restaurants you’ll find in Lisbon, is the influence of trade and exploration, combined with the local geography of ingredients available in Portugal. Location and Geography – With a long coastline facing the Atlantic Ocean, Portugal is known for being one of the best countries in the world for fresh local seafood. So it’s pretty self explanatory that seafood, ranging from fish to shellfish and crustaceans, plays a major part in Portuguese cuisine. In addition to seafood, Portugal has a Mediterranean climate, with an abundant access to fresh vegetables and Mediterranean climate fruit, and excellent olives and wine. Exploration, Trade, and Foreign Influence – One of the most interesting points of Portuguese cuisine is the fact that salted preserved cod-fish (bacalhau), which is caught in the North Atlantic near Norway, is the national food of Portugal. There are said to be over 365 recipes to make bacalhau and this just goes to show the importance of trade and foreign influence in Portuguese cuisine. Additionally, you’ll find spices and ingredients from around the world, particularly from former Portuguese colonies used in Portuguese food. I especially enjoyed the international restaurants in Lisbon, particular Mozambican food. I for one, have a major debt of gratitude to Portugal and their spread of certain ingredients, namely the chili pepper, which Portuguese delivered from South America to Asia. I’m hugely thankful for chilies in Asian cuisine – what would Thai food be without chilies! And are you a Japanese tempura lover? We all have the Portuguese to thank for introducing tempura to Japan. In this Lisbon travel guide I’ve just included a very brief introduction to Portuguese cuisine, but you’ll find a selection of restaurants below. Lisbon has a great variety of food options that include everything from local Portuguese family run restaurants, to giant seafood restaurants, to many ethnic restaurants that serve food from Portuguese colonies. 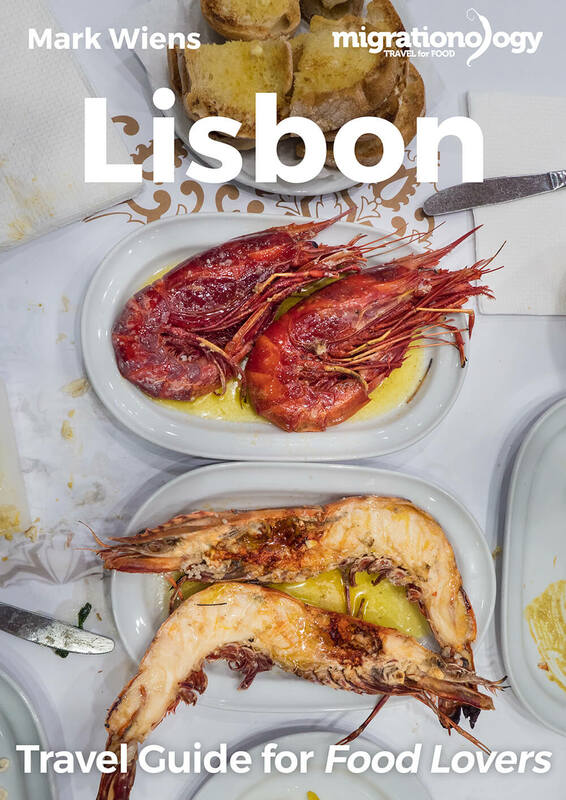 In this Lisbon travel guide I haven’t included an exhaustive list of restaurants in Lisbon, but I just included a few of the best restaurants I personally tried during my visit. If you have any other recommendations, I’d love for you to share it in the comments section below. Cervejaria Ramiro – This is probably one of the most famous restaurants in all of Lisbon for seafood, and they have gained a reputation because they live up to their standard for serving outstanding seafood and reasonable prices. 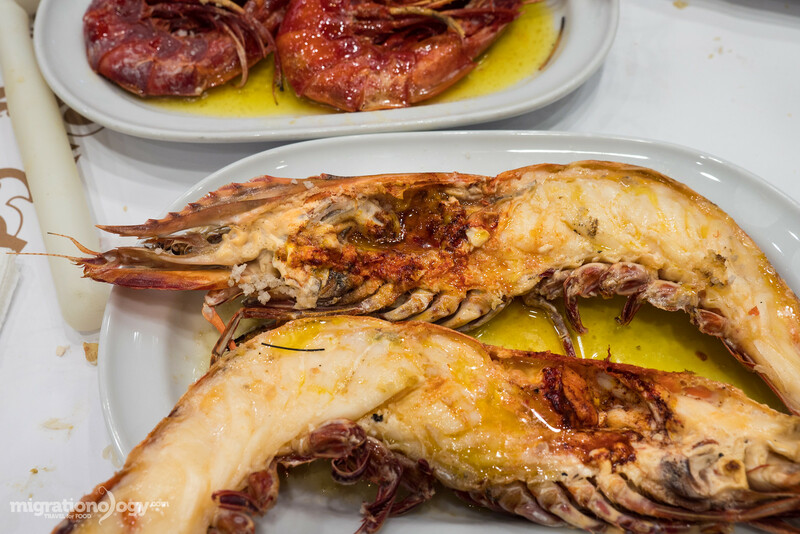 When I ate at Cervejaria Ramiro, there was a mixture of both locals and tourists, but everyone had a desire to devour some incredibly delicious seafood. The seafood at Cervejaria Ramiro won’t disappoint you. They have a wide selection of mostly shellfish and crustaceans, including the most humongous tiger prawns and most juicy velvet prawns I’ve ever had in my life. 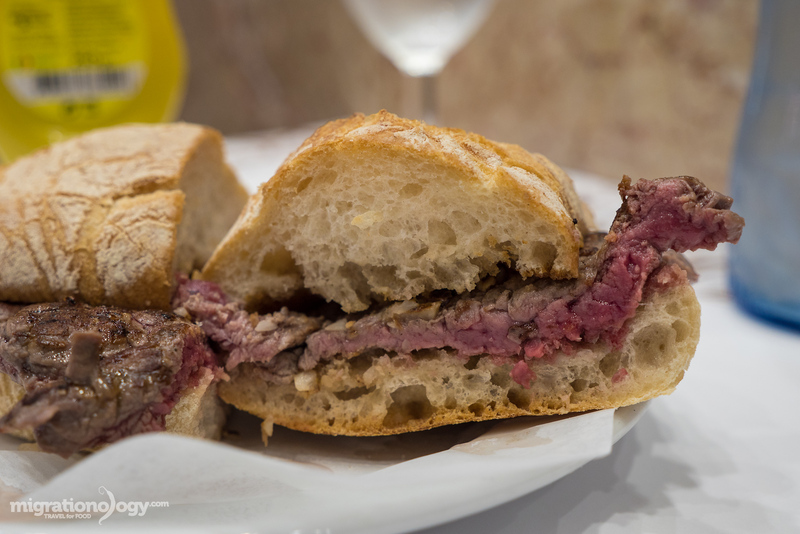 Don’t forget to finish your meal at Cervejaria Ramiro with a prego (steak sandwich). Address: Avenida Almirante Reis, 1H, Mouraria, Lisboa; Open hours: 12 noon – 1 am from Tuesday to Sunday (closed on Monday). Frangasqueira Nacional – One of the most well known of all Portuguese foods is piri piri chicken. Frangasqueira Nacional is a tiny hole in the wall restaurant that is making a name for themselves for serving some of the best piri piri chicken in Lisbon. The chicken was absolutely wonderful, grilled so it was juicy and slightly charred, and then it was drenched in an oily slightly spicy piri piri sauce. 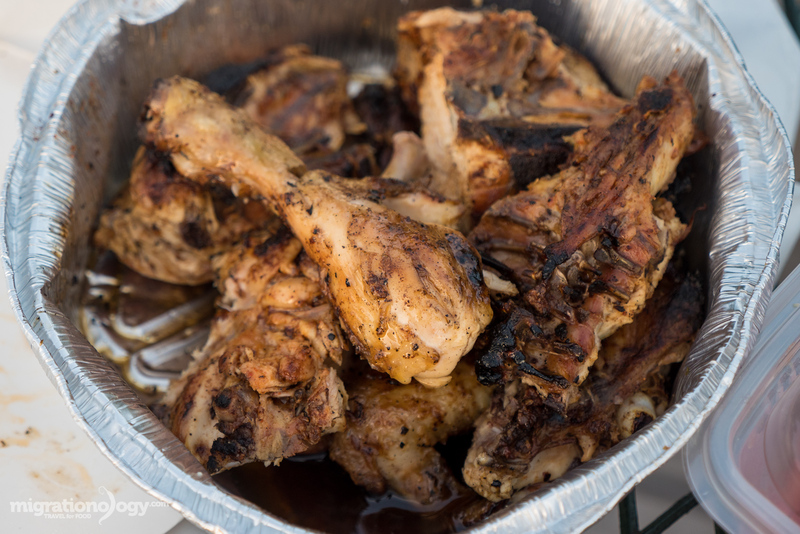 You’ll want to lick your fingers as you polish off your piri piri chicken. By the way, if you’re interested in making piri piri chicken, here’s an awesome looking recipe. Address: R. da Imprensa Nacional 117, 1200-214 Lisboa; Open hours: 12 noon – 3 pm and 6:30 pm – 10 pm on Tuesday to Sunday (closed on Monday). Restaurante Bonjardim – Located in the touristy walking streets behind Restauradores Square, Restaurante Bonjardim is a general Portuguese food restaurant and the place where my wife and I had our first meal in Lisbon. The food was overall alright, probably not the best, but I thought it was a nice place to sit and enjoy the ambiance while eating pretty good Portuguese roast chicken. If you like liver, don’t miss the Arroz Brasileiro, which was a bowl of rice fried with liver. Address: Travessa do Santo Antão, 12, Rossio, Lisboa; Open hours: 12 noon – 11:30 pm daily. Taberna da Rua das Flores – When I was researching for the best restaurants in Lisbon, I came across Taberna da Rua das Flores. What I didn’t know is that for lunch they serve traditional Portuguese food, but for dinner they serve a seasonal menu of Portuguese ingredients but fusion style dishes. We went for dinner one evening in Lisbon and although I was hoping for traditional Portuguese food, the fusion menu was incredibly good. It’s a trendy restaurant, but you’ll find some delicious food at Taberna da Rua das Flores, and a staff that you can feel is passionate about food. Address: Rua das Flores 103, 1200-194 Lisboa; Open hours: 12 noon – 11:30 pm on Monday to Friday, 6 pm – 11:30 pm on Saturday (closed on Sunday). Pastéis de Belém – From Macau to Brasil, and available at bakeries across the world, and even at KFC in Thailand, Portuguese egg tarts are a favorite Portuguese pastry. Originally discovered by Portuguese nuns at Jerónimos Monastery in Belém, the sweet treats soon became popular and spread across the world. Pastéis de Belém is the original place that started selling Portuguese egg tarts, dating back to 1837. What I loved about the egg tarts at Pastéis de Belém is that the crust was layered and extremely crispy and flaky, while the egg tart in the middle was creamy and rich. Address: Rua de Belém nº 84 a 92, 1300 – 085 Lisboa; Open hours: 8 am – 11 pm daily. Time Out Market Lisboa – Once a historic market in Lisbon (and it’s still partly a fresh wet market), the Time Out Market Lisboa is a modern market concept that includes restaurants, food stalls, and bars with communal tables all under one rood. It’s like a cross between a food court and market food center, yet with a selection of both Portuguese and international food. Many of the stall are on the gourmet and trendy side, but it’s a great place to sample a variety of food in Lisbon in a social atmosphere. Address: Av. 24 de Julho 49, 1200-109 Lisboa; Open hours: 10 am – 12 am on Monday to Friday and 10 am to 2 am on Saturday and Sunday. 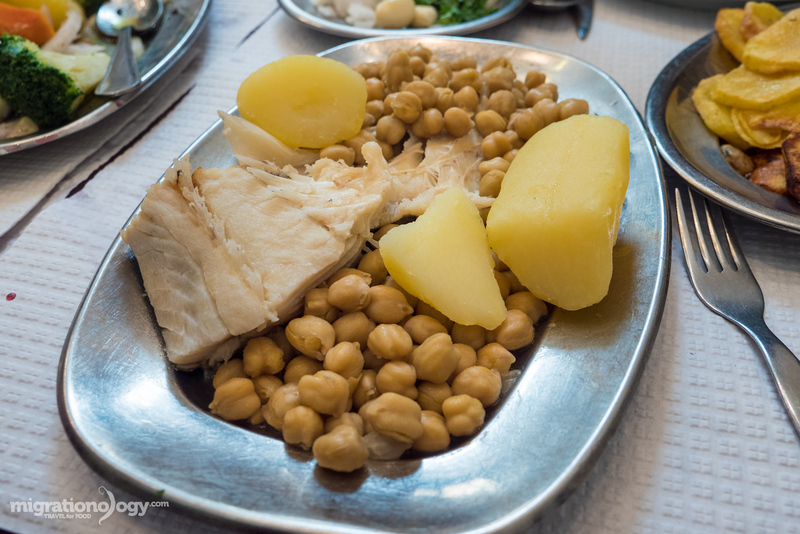 Salted codfish with garbanzo beans, a classic Portuguese dish. Restaurante A Merendinha do Arco – Located just a stones throw from Rossio Square in downtown Lisbon, Restaurante A Merendinha do Arco is a traditional Portuguese restaurant. 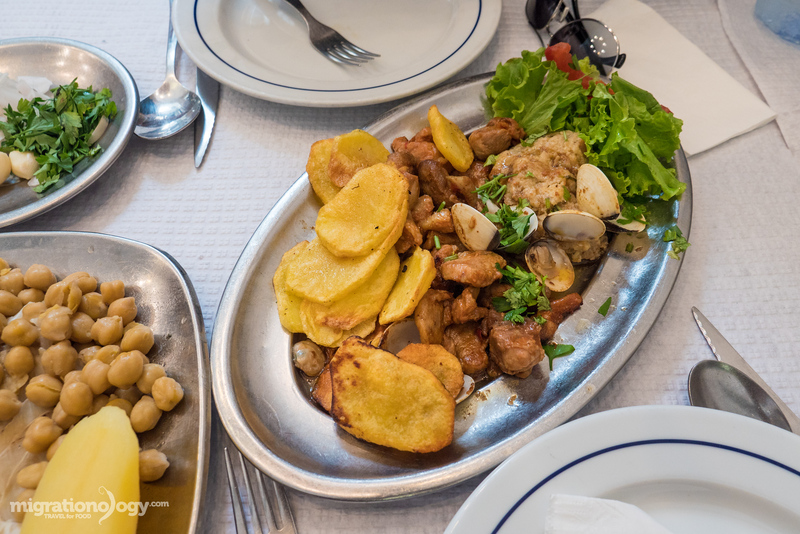 Ying and I ordered bacalhau com grão, one of the classic Portuguese foods of salted cod and garbanzo beans, and carne de porco à alentejana, pork with clams. The food is hearty and filling and classic Portuguese. Address: R. dos Sapateiros 230, 1100-581, Lisboa; Open hours: 8 am – 8 pm on Monday to Friday, 1o am – 3 pm on Saturday, closed on Sunday. Chinês Clandestino Restaurant – When my wife and I were in Lisbon, I found that many local Portuguese restaurants are closed on Sundays, and so after checking the opening times of a bunch of restaurants I wanted to try, all of which were closed, we decided to eat Chinese food. Chinês Clandestino Restaurant is a slightly secretive restaurant located on the second floor of a building in a neighborhood and there’s no sign for the restaurant. The food was overall good, and by far the best dish was a bowl of beef with cabbage in a Sichuan style chili oil with Sichuan pepper. Along with the food, the secretive nature of the restaurant is what makes it fun to visit. Address: Rua da Guia, 9, 2 Dto, Mouraria, Lisboa; Open hours: 11:30 am – 3:30 pm daily. Restaurante Cantinho do Aziz – One of the reasons I loved Lisbon so much was because of the international influence especially from former Portuguese colonies like Brasil, Angola, and Mozambique. Restaurante Cantinho do Aziz is a Mozambican food restaurant in Lisbon that I was thoroughly looking forward to trying. I started with a plate of samosas that, when paired with the chili sauce provided, were some of the best I’ve had in a long time. Next I had the lamb ribs curry which was outstanding. This is one of my favorite restaurants featured in this Lisbon food guide. Address: R. de São Lourenço 5, 1100-530 Lisboa; Open hours: 12 noon – 11 pm daily (but I think they sometimes might closed in the afternoon for a while between 3 – 7 pm or so). 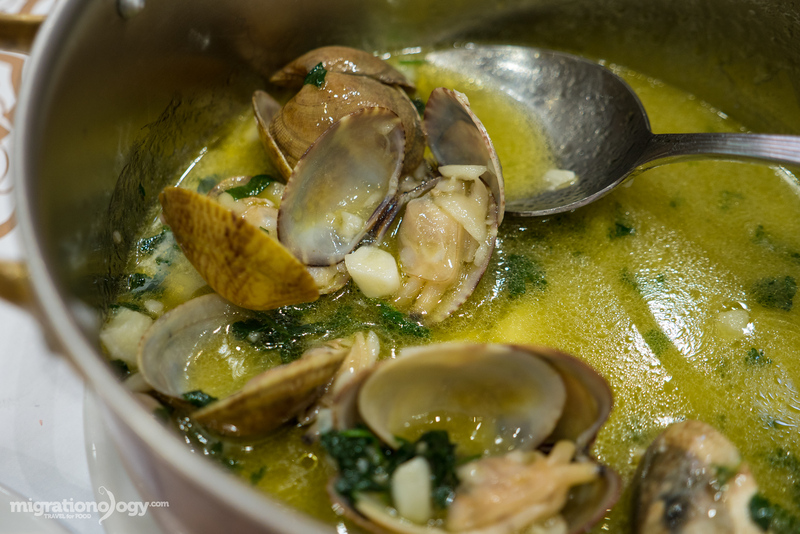 Solar dos Presuntos – If you’re ready for a fine dining Portuguese seafood meal, Solar dos Puntos is the place to go in Lisbon. It’s not a cheap restaurant by any means, but the food and wine they serve are of highest quality. Even though most of the menu is seafood based, one of the other things Solar dos Puntos specializes in is Jamón ibérico, and as you sit down at a table there will be a plate of jamon waiting for you. Address: R. Portas de Santo Antão 150, 1150-269 Lisboa; Open hours: 12 noon – 3:30 pm and 7 pm – 11 pm on Monday to Saturday (closed on Sunday). Cafe Martinho Da Arcada – As I sat drinking my coffee at Cafe Martinho Da Arcada, I just couldn’t stop thinking that I was having a coffee at a cafe that opened in 1782! 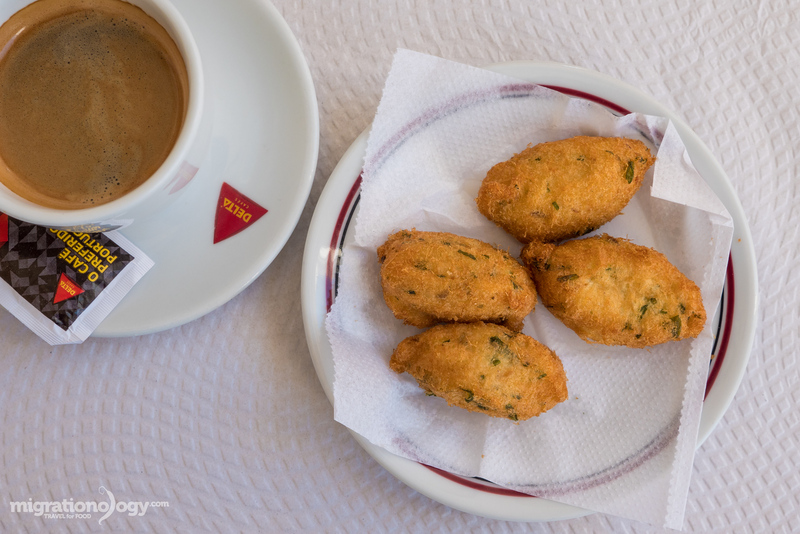 Although some say it’s become too touristy and expensive, I had a couple cups of coffee and some pastéis de bacalhau (codfish fritters), both of which were delicious. Address: Praça do Comércio 3, 1100-148 Lisboa, Portugal; Open hours: 7 am – 11 pm on Monday to Saturday (closed on Sunday). Café A Brasileira – This legendary coffee shop in Lisbon has a lengthy history and in its existence has been a favorite cafe for a variety of Portuguese poets and authors. As for the coffee, I’m happy to report it is fantastic – so good that I had to have two cups back to back, and if it wasn’t so late in the afternoon when I went to Café A Brasileira, I probably would have had a couple more. Address: R. Garrett 120, 1200 Lisboa; Open hours: Open 24 hours. A Ginjinha – Just a tiny hole-in-the-wall bar off Rossio Square in Lisbon, A Ginjinha serves ginjinha, which is a Portuguese liquer made from sour cherries. 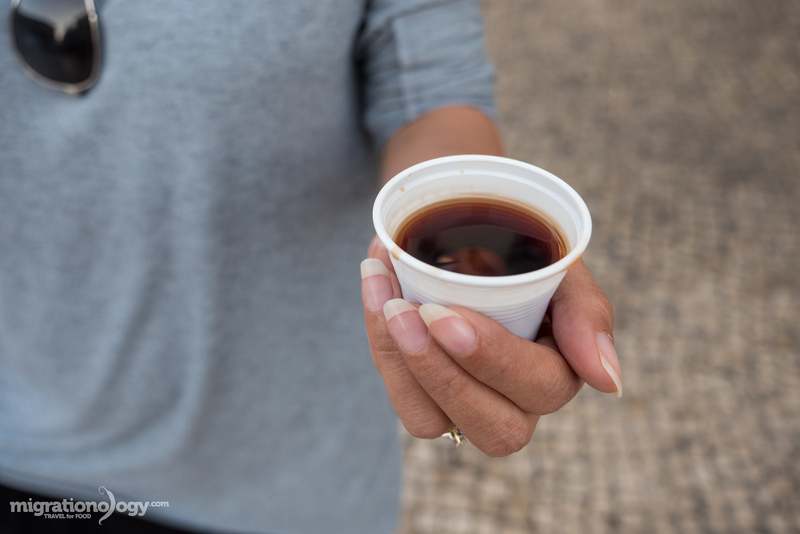 You’ll notice everyone who steps into A Ginjinha comes out with a little white plastic cup. Ginjinha was pretty sweet for my taste, but it was a great experience of ordering from the legendary bar and hanging out in the square with my white plastic cup. Address: Largo São Domingos 8, 1100-201 Lisboa; Open hours: 9 am – 10 pm daily. Restaurante Zé da Mouraria (I think it is typically closed for the month of August for holidays, which is the month I happen to be in Lisbon) – This is a Portuguese restaurant that I had at the top of my list to try in Lisbon. To my disappointment, they were closed the entire time I was in Lisbon, so I didn’t have a chance to eat here. So let me know if you go! Address: Rua João do Outeiro, 24/26, Mouraria, Lisboa; Open hours: 12 noon – 4 pm on Monday to Saturday (closed on Sunday). 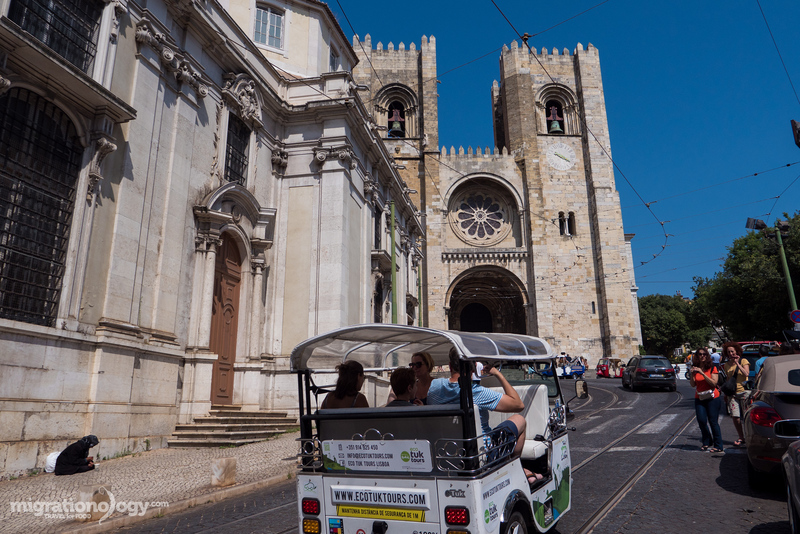 Along with eating, Lisbon is also a fantastic city to walk around and do some sightseeing. From ancient churches to the castle that sits on the top of the hill overlooking the city, Lisbon has plenty of attractions that are well worth visiting in addition to all the delicious food. In this Lisbon travel guide blog, I’ve listed a few of the main attractions I visited during my trip. 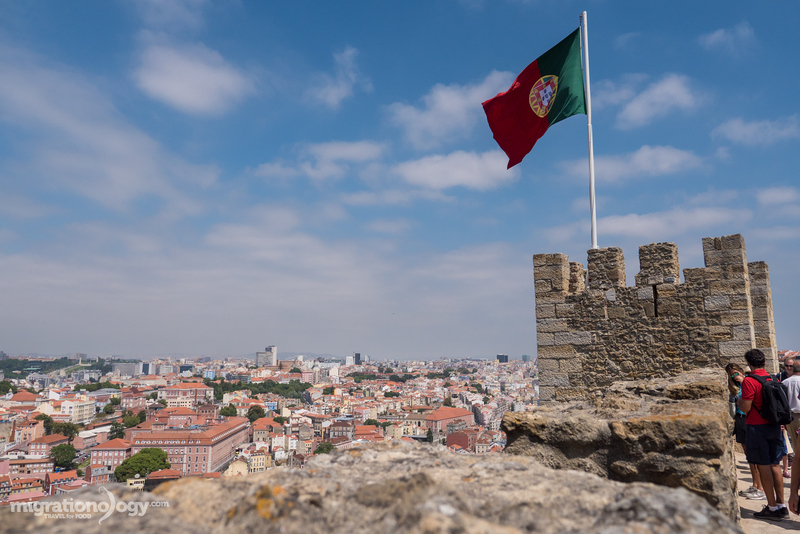 Castelo de São Jorge – One of the top things to do in Lisbon is explore Castelo de São Jorge. Originally built by the Moors in the 11th century as a citadel on the top one of Lisbon’s hills, the castle has had a long and eventful history. When I visited the castle, it was quite busy, but I still enjoyed wandering around the castle, and the highlight for me was walking along the top walls of the castle while enjoying beautiful views of Lisbon. Address: R. de Santa Cruz do Castelo, 1100-129 Lisboa, Portugal; Open hours: 9 am – 6 pm daily; Price: 8.50 EUR per person. Elevador de Santa Justa – Along with various funiculars, the Santa Justa Lift is a fully functioning elevator in downtown Lisbon that dates back to 1902 and was designed by Raul Mesnier de Ponsard, a student of Gustave Eiffel. The elevator was a symbol of class and advancement in Portugal, and now it’s a popular tourist attraction. You can either pay a fee and take the elevator up and down, or you can access it from the back-side cafe to avoid the fee and just go up to the top for a lesser fee to get a great view of Lisbon. Address: R. do Ouro, 1150-060 Lisboa, Portugal; Open hours: 7 am – 11 am daily; Price: 5 EUR per person for roundtrip ticket. 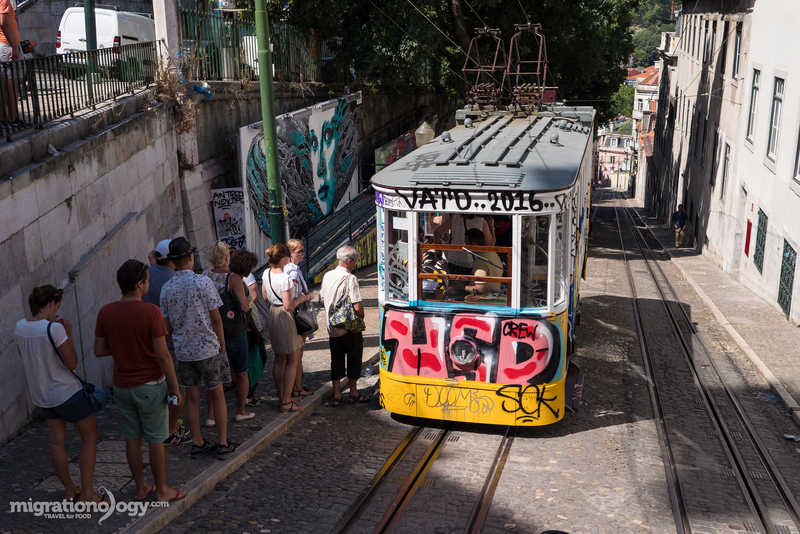 Ascensor da Glória – Since Lisbon is a very old and hilly city, one of the uniquenesses about Lisbon is that there are still many historical funiculars that transport people from the bottom to the top of hills. Ascensor da Glória is one of the main funiculars, and once you’re at the top you can visit Miradouro de São Pedro de Alcântara for an excellent view over Lisbon. Address: Calçada da Glória 6, 1250-001 Lisboa, Portugal; Open hours: 7 am – 11:45 pm on Monday – Friday, 8:45 am – 12 am on Saturday, and 9:15 am – 11:45 pm on Sunday; Price: 3.60 EUR per person roundtrip. Igreja de São Roque – With a history dating back hundreds of years, Igreja de São Roque is the oldest and most important Jesuit church in Lisbon. Although it appears to be relatively plain and un-flashy from the outside, the church within is loaded with riches. The Capela de São João Baptista, a chapel within the church is loaded with marble, amethyst, alabaster, and lapis lazuli and is considered to be one of the world’s richest chapels. There’s also a museum that connects to Igreja de São Roque where you can see a collection of religious art and relics. Address: Largo Trindade Coelho, 1200-470 Lisboa, Portugal; Open hours: 2 – 7 pm on Monday, 10 am – 7 pm on Tuesday to Wednesday and and Friday to Sunday, and 10 am – 8pm on Thursday; Price – church is free, but museum is 2.50 EUR. Lisbon Cathedral – Built in 1150 and officially known as the Patriarchal Cathedral of St. Mary Major, this Roman catholic cathedral is the oldest building in Lisbon and a spectacular sight to see, both the inside and out. What I really liked is that you’re walking along in Lisbon through the narrow lanes of the city and all of a sudden you come to an opening within the streets and the magnificence of the symmetrical cathedral seems to come out of nowhere. Address: Largo da Sé, 1100-585 Lisboa, Portugal; Open hours: 9 am – 7 pm daily; Prices: free entrance but there’s a small fee to enter the cloisters. Museu Calouste Gulbenkian – The Museu Calouste Gulbenkian is an art museum in Lisbon that houses a collection of sculpture, jewelry, and many painting exhibitions. The highlight for me was seeing some original paintings by Rembrandt. I wouldn’t really recommend it as one of the top things to do in Lisbon if you don’t love art, but if you do, it’s well worth a visit. Address: Av. de Berna 45A, 1067-001 Lisboa, Portugal; Open hours: 10 am – 6 pm from Wednesday to Monday (closed on Tuesday). Entrance price: 10 EUR per person, but if you go on Sunday it’s free entrance. Oceanário de Lisboa – Especially a great thing to do with kids in Lisbon, but also fun for any animal lover, the Oceanário de Lisboa is one of the largest aquariums in Europe. The main section is a giant center aquarium surrounded by smaller aquariums and displays are marine creatures from around the world. Address: Esplanada Dom Carlos I s/nº, 1990-005 Lisboa, Portugal; Open hours: 10 am – 8 pm daily. Entrance price: 17 EUR per person. 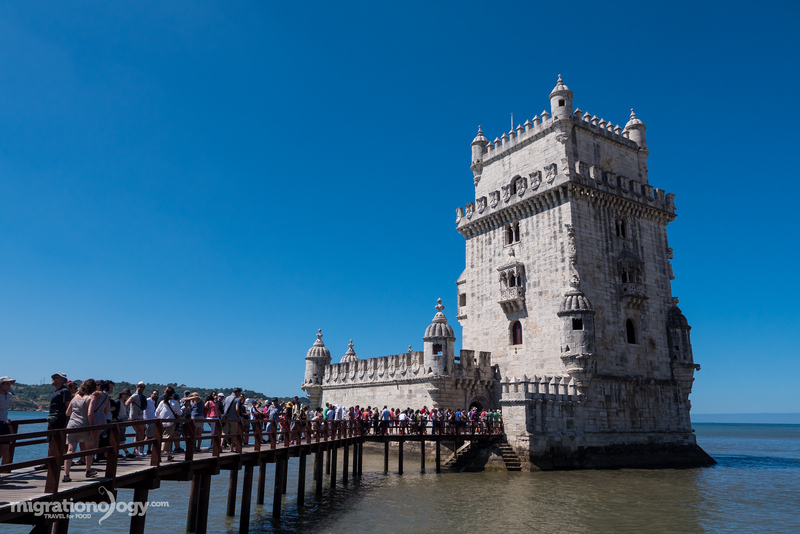 Belém Tower – Some of the most famous attractions in Lisbon are located in Belém, an area of Lisbon located on the mouth of the Tagus River about 6 km from the center of the city. One of the iconic attractions and landmarks is the Belém Tower, a defense tower that was built in the 15th century. Once you pay your entrance fee, you can throughout the tower. Definitely the highlight for me was climbing the tight circular staircase to the top for the view overlooking the Tagus River. Address: Av. Brasília, 1400-038 Lisboa, Portugal; Open hours: 10 am – 5:30 pm (but last entrance at 5 pm) from October to May, and 10 am – 6:30 pm from May to September. Entrance price: 6 EUR per person. Jerónimos Monastery – Declared a UNESCO World Heritage Site, Jerónimos Monastery in Belém is a spectacular monastery in Lisbon. There are two main sections that you can visit at Jerónimos Monastery, the cloisters (where you have to pay an entrance fee) which reminded me of the Taj Mahal. The other part of visiting Jerónimos Monastery is the main cathedral, which is built in Late Gothic Manueline style and is one of the most impressive things to see in Lisbon. My wife and I visited Jerónimos Monastery on a Sunday, and the line to get into the cloister took about an hour, so it was a little long, but the cloister was incredible. Address: Praça do Império 1400-206 Lisboa, Portugal; Open hours: 10 am – 5:30 pm (but last entrance at 5 pm) from October to May, and 10 am – 6:30 pm from May to September. Entrance price: free to enter church, 10 EUR per person to enter cloister. Getting around Lisbon by public transportation is overall pretty convenient, though it can get pretty crowded at times (as I found out when waiting for the buses a couple times). If you love to walk, and if you’re ready for some exercise (Lisbon is a hilly city) you can get many places within central Lisbon by foot. 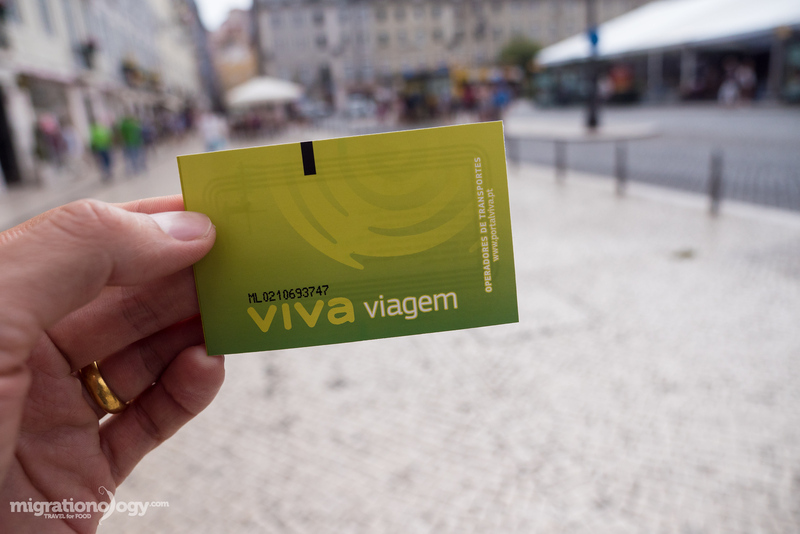 Viva Viagem Card – If you’re planning to take public transportation around Lisbon, it’s very convenient to stop by at any of the Metro station and buy a Viva Viagem card which costs .50 EUR and then you can add money onto it and use it for many types of Lisbon public transportation including metro, bus, and trams. Lisbon Metro: The Metro in Lisbon functions pretty well (though sometimes it’s a little infrequent and congested), but you can get many places around the city using the Metro and a little walking. Single ticket rides cost 1.40 EUR or 1.25 EUR per ride if you have a Viva Viagem card. Depending on your schedule, you can also consider a 1 day pass for 6 EUR. Bus (Carris): If you have access to the internet, you can use Google maps to find bus routes where you’re going. Ying and I took a bus from Praça da Figueira to Castelo de São Jorge. I just used my Viva card to swipe and pay, but I think the ride was 1.25 EUR. But on board bus tickets cost 1.80 EUR. Tram (Carris): In addition to vintage trams and funiculars, Lisbon also has modern trams. My wife and I took the tram from Cais do Sodré station all the way to Belém which was about a 20 minute ride. Again, you can use your Viva Viagem card to pay for tram fare. Otherwise on board tickets cost 2.85 EUR. Private taxi: Finally, there’s always an option for taking a private taxi in Lisbon. Rates begin at around 3.50 EUR and go up by distance and time. Here’s a good pricing estimate tool. When it comes to prices and expenses in this Lisbon travel guide, it’s not nearly as expensive as most of Western Europe, but it’s still quite a bit more expensive than Eastern Europe. I would say you could get by on a similar budget in Lisbon as Istanbul, maybe a bit more expensive. 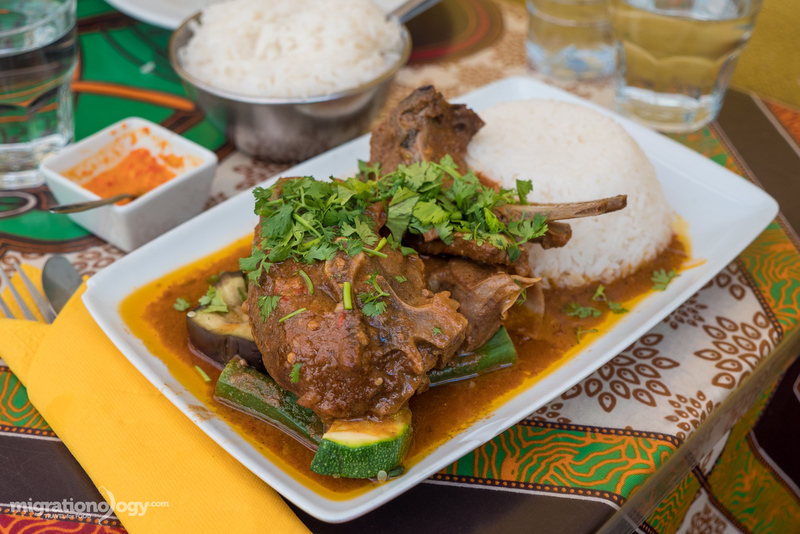 Transportation and accommodation can be affordable, and for food it all depends on what you eat – food ranges from 5 EUR a meal to 50 EUR per meal (or more). One thing I’d like to say is that eating fresh seafood in Lisbon provides outstanding value for money. The prices in this Lisbon travel guide that are listed above are all from my experience, and things I paid for during my visit to Lisbon. Just like any destination there are many ways you can save money and get by on much less if you would like and if you travel strategically to do so. Again, Lisbon is overall pretty affordable compared to most of Western Europe, and especially for the food, the value you get from the amount you pay is well worth it. During my trip to Lisbon, Portugal, I filmed a daily food and travel vlog that includes all the restaurants and attractions listed in this Lisbon travel guide. You can watch all the videos in order below. (Or you can watch the Lisbon video series on YouTube here). On this map you’ll find all the restaurants and attractions listed in this Lisbon travel guide for food lovers. Sipping a cup of coffee at a cafe that was opened in 1782, I just couldn’t stop thinking to myself what an awesome city Lisbon is. Everything from the historical attractions to the laid back lifestyle and delicious food is what makes it such a fantastic place. For food lovers, you’ll have no shortage of delicious food to eat in Lisbon. From classic Portuguese food to seafood that will blow your mind, and a host of restaurants that serve ethnic cuisine from former Portuguese colonies, the food scene is Lisbon is exciting. I hope this Lisbon travel guide for food lovers will give you some great tips for your visit to Lisbon, Portugal! You can download this Lisbon Travel Guide for Food Lovers as an eBook in PDF format. It’s free to download, but if this information has been helpful to you and you would like to “add in your own price,” I would be very grateful for your support.